10 km - 2hrs 30min cut-off, crawlers get 3hrs. The faster ones are challenged to get to the finish-line in under 1hr 30min. Where: Meeting Point at Haathi Chai Point, Old Rajpur next to Shenshai Ashram, Dehradun. Finish point at Chaar Dukaan, Landour, Mussoorie. Are you tough enough? Do you have it in you? Some would crib that it is longer, 10.1 to 11kms. Others would believe that the clock is moving faster than it should. If you are looking for excuses, this isn't for you. Below is a video of recce done on 11th June 2016. More videos will be updated from a recce done on 16th April 2017. If you fancy having the world's best tea before the run and yet again world's best pan-cakes post the race, then don't think, just come along. There is only one-way to find out, by getting to the start line. Haathi bhai with his portrait. 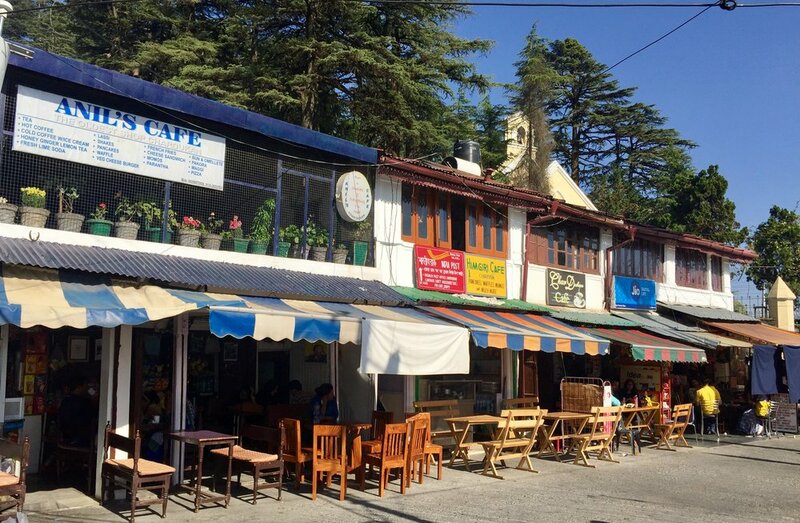 The 'run' would get over at the famous 'Chaar Dukaan' in Landour, Mussoorie, which aren't Chaar any more. Start is from that tree next to Duster. In British times, this was the toll point where toll was based on the mode of transport, mule to elephant. At the start point of the run. The run will start at sharp 5:30 am. Click above to zoom it. It's an ancient board but we'll be happy to charge you a registration fee if you are late. It'll be an understatement to say that this run is a bit uphill. So did you think it would be easy? Don't get excited. I turned around to take this shot. It's just a hill. Get over it. 9km mark is when you are passing the market. The view from the sharp u-turn. When in doubt, there is no doubt. Take the tougher path ahead. So sharp left here. Again, I turned around to take this pic. Only 200 more metres to go. Pan-cakes here are to die for. Trust me, you almost will. Registrations fee is waived for the first edition. No, there will be no papers (aka certificates) and pieces of metals (aka medals) for your attempt. Only an awesome experience. Please get your own supplies. At the start, please pick stuff from Haathi bhai. Then the next shop is only after 5.5 kms. Then at 7.3 kms, 8 kms and at 9 kms there is a whole market for you. At the finish, you'll have seven shops that have been lost in translation and are called Chaar Dukaan. Email on info@laultra.in to confirm you participation.